You decide — how long to play and how much to pay! The best value for fun in the Los Angeles area; SpeedZone has something for everyone and always at the perfect price. SpeedZone's a great place for a first date or a family day of racing! Check out the Promotions tab for available deals. A Full Day of Unlimited Attractions! Buy 2 days before your visit & save! Good toward unlimited attractions. Arcade games not included. Purchased for individual use. Passes cannot be split or shared. Not valid with any other promotion or discount. RAD Pass fully priced at $49.99. Other restrictions may apply. Show your AAA card and get $5.00 off a RAD Pass. Must show AAA membership card. Not valid with any other discount. Offer available in-park only. Must upgrade to a Season Pass on day of visit to receive Season Pass if not purchasing Season Pass outright. Upgrade may require an additional fee. Other restrictions may apply. SUPERCHARGE DEALS - GET MORE WHEN YOU BUY ONLINE! Supercharge cards may not be used to purchase attraction packages such as our Race-All-Day Pass. Play cards are valid on all attractions including racing, miniature golf and video games. Excludes food, beverage or retail items. Card activation fee may apply. NO REFUNDS once purchased. Children 5 and under free (one round free, per day with paying adult). Get the rest of 2019 for less than the price of a single day! 2019 Season Pass Holder Benefits - Better Than Ever! BENEFIT WHEN CAN I USE IT? WHEN DO I NEED TO PURCHASE BY? Turbo Track, Slick Trax, Lil Thunder Road, Mini Golf & Top Eliminator Dragsters 2019 Season Anytime! These tickets are automatically loaded on your Season Pass ID card. Please take your guest directly to the ticket counter when you wish to redeem these tickets. Our cashier will scan your Season Pass and issue a Play Card for your guest. Special event privileges at Boomers locations! FREE Easter Egg Hunt during Bunny Bash Eggstravaganza 2019 Anytime! FREE Halloween Horror 2019 Anytime! FREE Noon Year's Eve 2019 Anytime! NEW! 20% off retail! 2019 Season Anytime! 2019 Premium Snack Bucket 2019 Season Anytime! Monthly offers on food & games! Valid email address and active e-news subscription are required in order to receive entitlements for monthly offers on food and games. 2019 Season Anytime! Free admission to all Apex locations! 2019 Season Anytime! Limited time offer. May upgrade to a Season Pass on day of visit to receive Season Pass if not purchasing Season Pass outright. Upgrade may require an additional fee. Not valid with any other promotion or discount. $44.99 price per Pass valid only when purchasing 3 or more Season Passes in the same transaction. Individual Season Passes may be purchased for $46.99 each online or $49.99 each in-park. 2019 Season Pass valid any regular operating day through December 31, 2019. Arcade games not included. Excludes special event/buyout dates. Purchased for individual use. Season Passes cannot be split or shared. Benefits may not transfer between parks. Valid email address and active e-news subscription are required in order to receive entitlements for monthly offers on food and games. Season Pass fully priced at $94.99. Sales tax and applicable fees not included. Other restrictions may apply. 2019 28oz Premium Souvenir Bottle - FREE REFILLS All Season Long! Available only to 2019 Season Pass Holders. 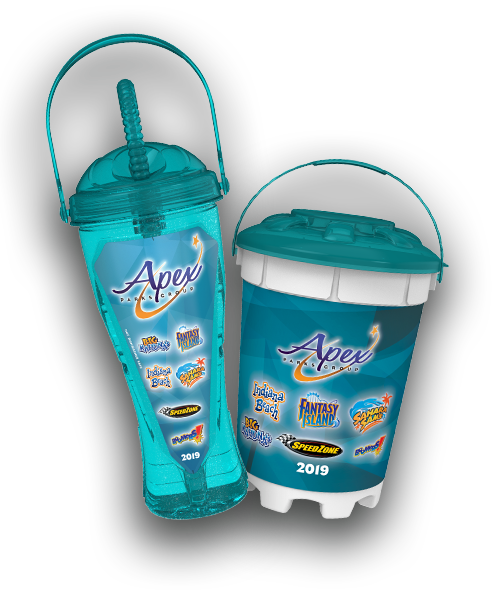 Get unlimited FREE fountain beverage refills through December 31, 2019, at ANY Apex Parks Group location. Limit (1) per valid 2019 Season Pass Holder. Good from time of purchase to December 31, 2019. Premium Bottle fully priced at $26.99. If lost or forgotten, a replacement fee may apply. Other restrictions may apply. 2019 64oz Premium Snack Bucket - FREE REFILLS All Season Long! Available only to 2019 Season Pass Holders. Get unlimited FREE popcorn and cotton candy refills through December 31, 2019, at ANY Apex Parks Group location. Limit (1) per valid 2019 Season Pass Holder. Good from time of purchase to December 31, 2019. Premium Bucket fully priced at $19.99. If lost or forgotten, a replacement fee may apply. 2019 Premium Snack Bucket fully priced at $19.99. Other restrictions may apply. Buy the Premium Souvenir Bottle and Premium Snack Bucket together for only $29.99 - 36% total savings! Unlimited attractions include: Turbo Track, Slick Trax, Lil Thunder Road, Mini Golf & Top Eliminator Dragsters. Limited time offer. $44.99 price per Pass valid only when purchasing 3 or more Season Passes in the same transaction. Individual Season Passes may be purchased for $46.99 each online or $44.99 each in-park. 2019 Season Pass fully priced at $94.99. Other restrictions apply. Join us for our first annual Bunny Bash Eggstravaganza and Breakfast with the Bunny! Enjoy a classic morning spread alongside our cotton-tailed comrade – tickets are only $7.99 if you buy early! Free egg hunts, live entertainment and more are in store! Click below to purchase your tickets and see a full schedule. Two players for the price of one! Bring your brother or sister to Boomers and enjoy BOGO Mini Golf. (1) Free mini golf ticket issued with purchase of (1) full-price mini golf ticket, valid for one game of mini golf for two people. Offer valid April 10,2019 only. Not valid with any other offer, promotion, or Season Pass program. Other restrictions may apply. EXCLUSIVE OFFERS FOR SEASON PASS HOLDERS! Hot and salty, the way you love ‘em. Tastes even better at only two bucks! Can be redeemed by valid 2019 Season Pass Holders April 1-30, 2019. Dipping sauces not included. While supplies last. Other restrictions may apply. Hone your skills. Demolish the competition. Bang that puck…on the house! One (1) free play will be added to your Season Pass each week during the month of April 2019, valid only on air hockey. Each “week” begins on Monday and ends on Sunday, unless the week is constricted by the first or last day of the month. Free play entitlements drop off at the end of each week and do not accumulate. Other restrictions may apply. SAVE UP TO $100 ON YOUR BIRTHDAY PARTY! Book your party now for big savings. When you choose the WOW/VIP Birthday Package, you’ll save big – up to $100 off on the best party ever. Packages include crowd-pleasing food, party room and more! Planning the party doesn’t get easier than this. Book your date now! Birthday party may be held any date thru June 30, 2019, but must be reserved by April 30, 2019 to receive discount.19 to receive discount. Valid on WOW VIP package only. Not valid with any other promotion or discount. Offer not valid for existing birthday party reservations. Other restrictions apply. Up to 8 Hours of Unlimited Attractions. Arcade games not included. Must show military ID. Not valid with any other discount. Offer available in-park only. Must upgrade to a Season Pass on day of visit to receive Season Pass if not purchasing Season Pass outright. Upgrade may require an additional fee. Other restrictions may apply.